Welcome back, my crafty friends! It’s Laura with you today, and I’ve got some festive cards with a fun twist! When opened, the images in the middle of the circle spin to create a cool, interactive effect perfect for Christmas cards. 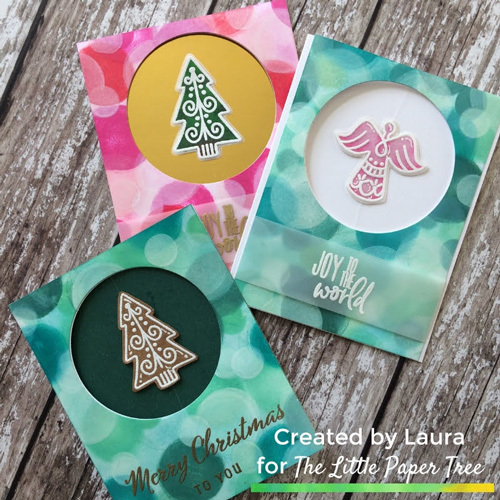 For today’s cards I used Catherine Pooler Designs (CPD) stamps included in the Home for the Holidays Stamp of Approval Box (SOA – now sold out!) along with Distress Inks to create all of these cards. Let’s get started as we have a lot to cover! I knew I wanted to create a spinner card using those delectable stamps in the Christmas Cookies stamp set from CPD so first thing I did was to prep some Crafter’s Companion Vellum and Kraft Card with a powder tool, then heat embossed using Versamark Watermark Ink and Ranger Superfine White Embossing Powder. I made two copies of each image, per card, so there’s a front and back. Symmetrical images work best for this technique so they match up easily. On the vellum images, I used just a few Zig Clean Color Real Brushes on the backside to give them a bit of color that almost looks like stained glass. On the front, I used a clear Wink of Stella marker over the image to really help them sparkle. The kraft image was almost perfect as-is but(because I have to tweak with everything 😉)I took a Sakura White Glaze pen to quickly add a few strokes and dots to make it look even more like frosting on a gingerbread cookie. I liked the look of it so much I added a few bits to the vellum angel as well! With my images ready to go, I cut a piece of clear thread and sandwiched it between two images using tape runner adhesive. I simply put the thread right down the center of the back of one image, then laid the other (face-up) on top. Easy-peasy! True fact: I didn’t have a clue what I was going to do for the front panel design. I had lots of ideas but nothing that really jumped out. Well, I ran out of room in my card design notebook and needed another one to use until I could buy a new one. I found an old notebook I used when I first started cardmaking and found a practice bokeh technique I’d obviously learned from a YouTube video or somewhere. It was in the most perfect shades of green (to go with the challenge) and just looked so pretty and festive so I decided to try it! I mean, I’d never actually used the idea (or technique) on a completed card so I knew this would be the PERFECT backdrop for my spinner cards! It’s super simple to create this dramatic, bokeh look. All you need are a few Distress (or dye-based!) inks (pigment inks don’t work as well here because they are more opaque and you can’t see the other colors through it as easily), a few Ranger Mini Ink Blenders and finger daubers, and a white pigment ink. I know I just said you don’t want pigment inks, but the white is different and becomes quite transparent as it dries. I found it easiest to keep my colors balanced by working from darkest to lights, largest to smallest, and in groups of threes. What that means is I started by inking a Mini Ink Blender with either my Evergreen Bough or Festive Berries then making three circles on an A2 panel. To make the circles, all I did was place my blender straight down on the paper and twisted it back and forth until I was happy with the coverage. On the red version, I also created three circles of “used” red (kinda like second generation stamping: I used ink left over from the original circle to make a red circle that was a few shades lighter. With the first pass of circles done, I worked my way down through the Distress Inks (save the white for later in the process!) making sure my circles were spaced all over the panel so it stayed balanced. After I had a good amount of circles down (but still quite a bit of white space) I moved onto adding the smaller circles. These circles tend to look best when brighter (to reflect bokeh effect in real life) so I only did a few small circles using just the brightest Distress ink (of each trio.) At this point I used the finger daubers to add just the faintest bit of colour to the areas on the panel that were still white. I didn’t try to get rid of all of it and added touches of colour randomly so that it looked natural but wasn’t stark white. Before I added the white circles, I laid down a few more large Distress circles in places I felt it was needed. Have fun with this and don’t overthink it. It’s such an easy technique and I don’t think you can really mess it up! Once I was happy with the amount of color coverage, I used my Mini Ink Blenders and finger daubers to add white circles using Lawn Fawn Yeti Pigment Ink. White pigment ink take FOREVER to dry so I hit it with my heat gun to speed up the process. With the ink dry, it definitely faded back to be quite transparent so I went over all the white circles and dried them again. Next I used the circle die from the Catherine Pooler Snow Globe Die (released today!) to cut a circle into the middle, upper-end of the panel to create a window. I did this for all of the panels. Two of the cards feature a vellum strip I heat embossed with gold or white embossing powder and adhered by taping to the back with clear cello tape. That lovely sentiment is part of several you can create from the Holiday Mix Stamp from the SOA box from CPD. The other sentiment is from the Festive Trimmings Stamp set (also from the CPD SOA box.) I just heat embossed in gold right onto the panel. I placed the panels onto Catherine Pooler card bases and used a pencil to trace the circles onto the front of the card bases so the windows would match up perfectly. Then I placed the same circle die (I used earlier) over the traced line and ran that through my Cuttlebug. Now we just need to add our spinning images! This is really easy to do. Just turn the front panel over and use a bit more tape to adhere the clear thread on both the top and bottom of the circle opening. Make sure you pull it really taught so the image will spin really well. On the top of the panel, I also wrapped the thread around (the top) a few times just to ensure it would stay put. All that’s left to do is cover the back of the panel with Tombow and add to the front of the card base. The circle will be in the perfect place so it’ll be a breeze to do. I felt the images needed just a little something more to help them really pop so I added a few touches to the inside of the card bases. On the green bokeh card with the pink angel I simply covered up the left, inside panel of the base and sprayed the right, inside panel with a bit of Pearl Diamond Spray and Sparkle from Crafter’s Companion. It’s hard to see it in the photos but it adds the perfect amount of contrast from the busy, front panel.For the red bokeh card I cut a panel of gold mirror to 4.25” x 5.5” and adhered to the right, inside panel of the card base (with Tombow.) Last, on the green bokeh card with the Kraft tree, I sprayed a bit of green cardstock with the Spray and Sparkle, cut it to A2 size, and added to the inside, right panel of the card base with Tombow. I’ll admit after writing that, it seems like a lot but really this is a fun card to make that really gets a big bang for your effort. And, I can’t believe I haven’t used the bokeh technique before because I. AM. IN. LOVE. Seriously! It’s such a beautiful effect that really works so well for the holiday season.